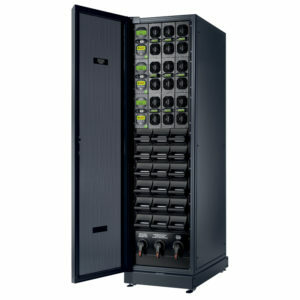 TRIMOD is a modular UPS guaranteed by the Legrand brand. Elettro suggests the TRIMOD typology as an alternative to single UPS in parallel in case of informatics and IT installations. 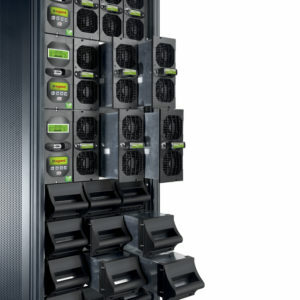 Thanks to its modularity, TRIMOD is an expandable in power and redundant UPS, which includes, in a single cabinet, using more power modules, all the reliability of parallel systems composed by two or more UPS. Batteries are mounted inside plastic drawers in the same UPS cabinet or in a separate cabinet for higher autonomy. During commissioning operations, TRIMOD is configurable as single phase input/output, three-phase/single-phase (until 30kVA/kW) or three-phase input/output (until 80kVA/kW). Maintenance is very easy thank to the modular lay-out. The power modules are replaceable in Hot-Swap mode, without power interruption. 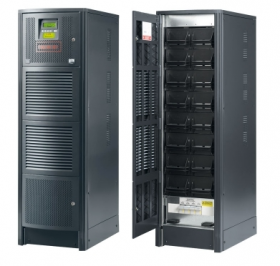 TRIMOD is an UPS with power factor equal to 1 and high performances. With 3,4kW, 5kW and 6,7 kW power modules it is possible to obtain the following power range: 10, 15, 20, 30, 40, 60 and 80kW. The redundancy of traditional parallels is obtained by adding one single power module for TRIMOD with single-phase output and three modules for the three- phase ones.